A court has found former French Prime Minister Alain Juppe guilty of involvement in a party funding scam in Paris in the 1980s and early 1990s. Juppe, one of President Jacques Chirac's closest allies, immediately appealed against the conviction. The court gave him an 18-month suspended sentence and barred him from political office for up to 10 years. However, he will be able to continue as mayor of Bordeaux, and as head of the governing UMP party during the appeal. The prosecution argued that Juppe allowed party employees to be put on the city payroll and to be paid for by private companies when he was deputy mayor of Paris. Mr Chirac was then the city's mayor. 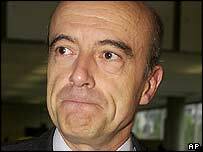 Juppe denied the charges, saying that he put an end to all irregularities as soon as he found out about them. He said this month he would quit politics if found guilty. He had widely been expected to run as the centre-right's candidate in the 2007 presidential election if Jacques Chirac does not seek a third term. "You can imagine the political earthquake this is going to cause," said Anita Hauser, political commentator for the private LCI television channel. "It's a hammer blow for Jacques Chirac, who thus loses his closest adviser and his designated successor, for whom he had real affection," she said. Juppe was prime minister between 1995 and 1997, when he lost an election amid industrial unrest caused by his attempts to push through social and economic reforms. He made no comment after the verdict was announced and left the courtroom by a back door. But his lawyer, Francis Szpiner, said the verdict was "questionable and unjust" and said he would file an appeal. "The court wanted to throw Mr Juppe out of politics," he said. Correspondents say Juppe's departure from the political scene would create an awkward vacuum at the top of the UMP party, which could result in a power struggle. BBC Paris correspondent Caroline Wyatt says the sentence itself could also raise fresh questions about Mr Chirac's own role in the party-funding affair, even though as French president he has immunity from prosecution. "The verdict tarnishes both Mr Juppe and his mentor"